Are you happy with the colors of your home’s bathrooms? When it comes to choosing the right colors for a space, you should consider a few factors: emotion, atmosphere, tone, and energy. For your bathroom, the right color choice depends on your style, whether you enjoy following trends, if you’re putting your home on the market, or if you’re creating a look that is uniquely yours. Follow this guide for choosing the right colors for your bathroom. For all painting projects, the color wheel will become your best friend. It’s a guide that will show you what colors complement each other, what colors match, and what they’ll look like together. If you’re starting from scratch or you have some inspiration, take it to the color wheel to map out some direction for your bathroom. The rule of three finds many homes throughout the art world, especially painting and photography. This rule can also be applied to the number of colors you choose for your bathroom. Three colors will help create a perfectly balanced scheme. Choose a neutral tone, one right color, and complete the look with a vibrant or dark accent. In application, use them in a 70 to 20 to 10 distribution throughout the room, starting with the lightest color. If you’re trying to create a serene and calm bathroom atmosphere, mixing neutral tones to create an understated but striking look would be an effective choice. Use a color chart to find tones that are closely related to provide some depth and contrast. For additional visual interest, incorporate different patterns and textures from the same color palette. 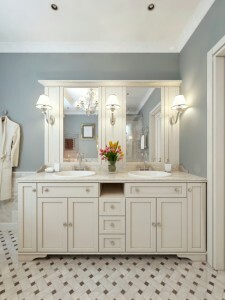 To liven up the bathroom with energy, use a bright accent color to complement a neutral or understated base. Another approach is to use two bright colors that complement each other to adding more intrigue to the room. You can achieve this energy with paint, but also other elements like a shower curtain, mirror trim, or even wall art. Reference your color wheel to find bright tones that sit across from each other, like orange and blue or yellow and purple.